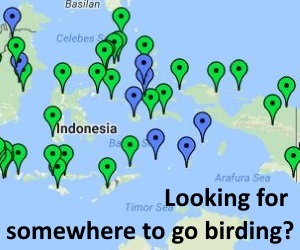 Everything you need to plan a birding trip to Indonesia: detailed site information; maps; searchable archive of trip reports; listings of local guides and tour companies; bird checklists; travel tips and more. From crowned-pigeons and birds-of-paradise, to endemic pheasants and pittas – Indonesia has some of the world’s best birdwatching. Spanning two continents and home to over 1,600 species (including almost 400 endemics) there are plenty of reasons to come birding in Indonesia, then come again and again. Information about Indonesia’s top birding sites, including key species, maps, access, local guides and resources. All trip reports from Indonesia that we could find are listed: browse the summaries, search by key words, or submit your own. A free checklist of the birds of Indonesia, including alternate taxonomies, sub-species and distribution by island. Online resources and links: birds and birding in Indonesia. 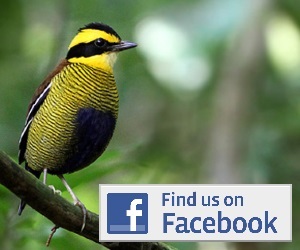 Services for birders in Indonesia: local guides, tour companies, travel agents, accommodation and services. Submit bird records from Indonesia.